Tomoghno Ghose and his team receive £1000 prize in the first round of the competition for student entrepreneurs. 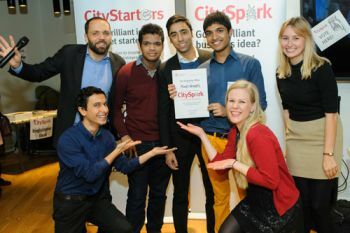 From over 100 entries, the 20 teams with the most innovative business proposals were invited to take part in the first round of CitySpark, City University London's innovation and enterprise competition. The budding entrepreneurs set up market stalls and pitched their ideas to guest judges and voted for their favourites. The guest judges were local entrepreneurs, business experts, City alumni, staff and students. Six prizes were up for grabs with £1000 awarded to the overall winner, £500 to two second place winners and £250 to three third place winners. Tomoghno Ghose (BSc Banking & International Finance) and his team were voted the overall winners taking home the top prize of £1000. Their Food Boxes innovation involves selling advertising space on the side of takeaway containers and providing them to local restaurants free of charge. If successful, Tomoghno along with team mates Krish Vijayakumar and Amit Haridasani, plan to donate a percentage of their profits to charities that tackle hunger and food poverty. Speaking of his delight at winning the top prize, Tomoghno said: "Participating in CitySpark brought out my entrepreneurial flair and from the very beginning I believed our idea had potential to become a sustainable business. The marketplace was a lot of fun and it was great to explain our concept and receive valuable feedback from the judges. Of course, nothing beats the feeling of being announced the winners of such a competitive event! "The prize money will be used to cover the costs involved in setting up the company and to make prototype food boxes." 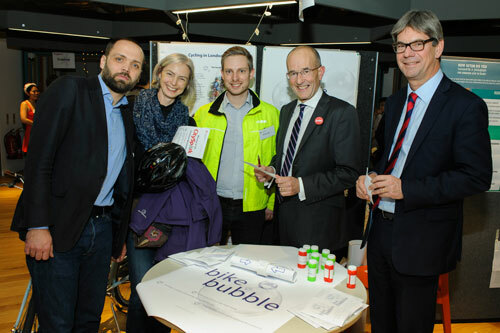 Second prize winners were Benjamin Lioue, with his Students Eat discount app and Gareth Sumner who has designed a device called Bike Bubble that clips to the handlebars of a bicycle providing a range of features including GPS and route information. Gareth was the recipient of this year's Design Council Scholarship to study on the Masters in Innovation, Creativity and Leadership (the MICL). Third prize winners were Andre Bushdid Wanner's Retox Box cocktail kit idea, Hakkim Akbar Ali for his DriveHero safety device for motorists and Sonya Barlow who is developing a gift-picking website called Blag. Enterprise Education Manager, Ben Mumby-Croft said: "The CitySpark festive marketplace provides a fantastic opportunity for students to test their business ideas in front of a live audience, gain feedback and raise small amounts of funding. "This is only the second year we've run the competition in this format but we've already seen many of last year's winning teams (Popcord, Ocushield, LoveThyChef, and Nudge) go on to raise further funding and put their ideas into practice." The CitySpark prize fund is sponsored by the City and Cass Future Fund and stage two of the competition kicks off in the new year. Visit the CitySpark webpages for additional details and to find out more about student enterprise at City. Pictured above: Ben Mumby-Croft; Dr Sara-Jones, Course Director for the MICL; Gareth Sumner, CitySpark winner; Vice-Chancellor Professor Sir Paul Curran and Stephen Avery, Chief Financial Officer.